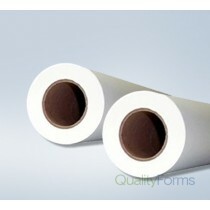 Plotter paper is an uncoated bond paper designed to work with inkjet printing equipment. This paper is used with plotter machines, which are printers used with computers, they are used to print vector type graphics. The plotter machine can print on different materials not just plotter paper, such as vinyl, plastic, and cardboard. Architects and designers favor a plotter machine as it allows them to create blueprints; they are also used with software programs and technical drawing programs. Plotter paper is also available in different forms one of which is called bond plotter paper, which is versatile and perfect for engineers and architects. We carry Plotter paper in all different textures and sizes.